I wanted to make the good old Stir Fried Hokkian Mee (Dai Lok Mee) for the longest of time. What really puts the plan off was this particular ingredient --- Chu Yao Zha (Cracklings from rendered Pork Lard). The additio of this crackling to the dish is so crucial that I personally think it is the heart and soul to a good plate of Stir Fried Hokkian Mee! 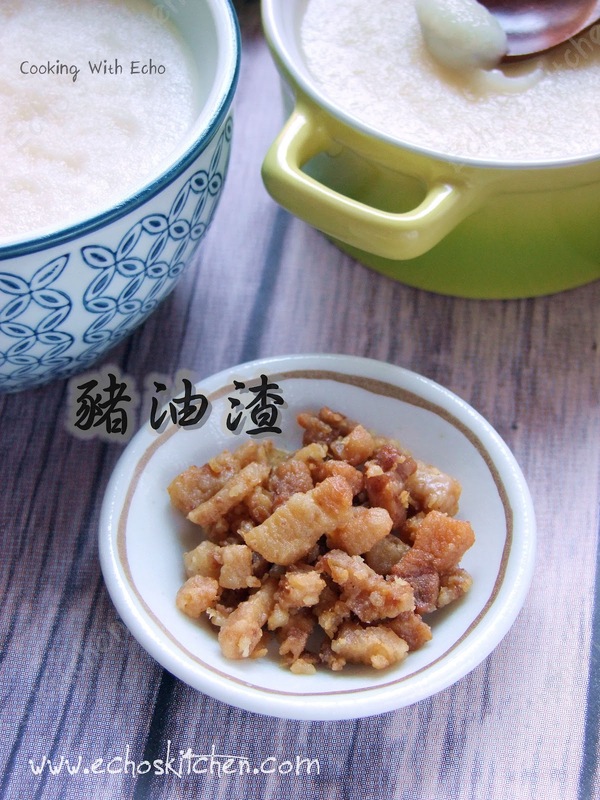 I finally found pork fat in the local Chinese supermarket and manage to make some pork lard and cracklings. You bet that Hokkian Mee will be soon to be in sight. 1. Cleaned and cut the pork fat into small cubes. 2. 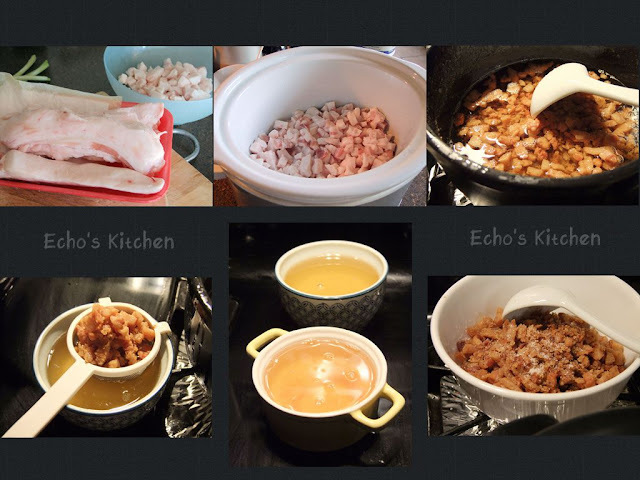 In a cookware/wok, add 1/2 a cup of water with all the fatty cubes, bring to boil and continue cooking at medium heat until water evaporate, turn to low to render all the fat out of the pork fat. 3. Stir occasionally until the crackling become crispy and oil rendered are cleared. 4. Separate the cracklings with the oil rendered using a sieve, sprinkle some salt on the cracklings, it gives better taste and preserves it longer. Note 1: If you have cast iron wok, making pork lard is the traditional way to season the wok, thus making it occasionally will helps to keep you wok non stick too! My mum makes her own too. I didn't know that some supermarkets give it out for free! Leaf... oh yes.. I saw your post yesterday.. your mum is a fabulous cook and welcome to my blog fellow Malaysian! When I get pork belly it always has the skin. Can you use the skin for rendering as well? just give a try. 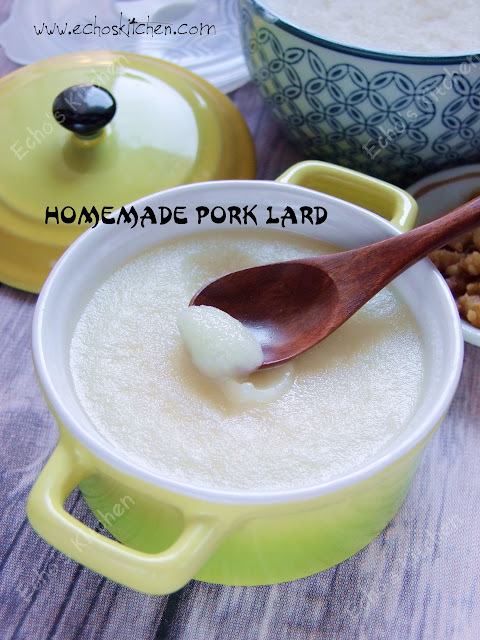 add a suitable amt of water about 20% of the total weight of the pork lard and fry. 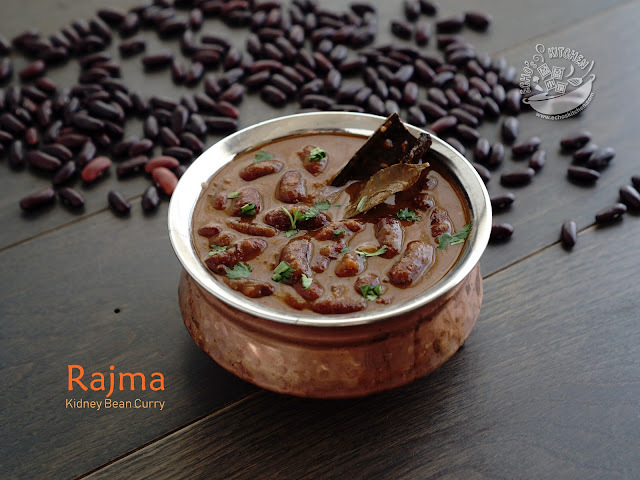 it will help to extract more oil from the fat. thanks for the tip!! I will do it the way you mention next time! Pork skin impossible to make into chee yau char cause I have try that experiment and it failed. What do you do with the rendered lard (the liquid part)?